Where to find wildlife in Australia. Just look around. It's everywhere. Koalas live on the east and south coast forests, high in the Eucalyptus trees. If you see a Koala Crossing sign on the highway, that's a sure give-away. Wild roos (and wallabies) frequent parks and grasslands in the evenings and early mornings. Snakes are harder to find, and if an Aussie sees it first, it's likely to be killed. Insects, birds and bugs, plus lizards, geckos and skinks abound. Your guide book will list many nature parks (in addition to the famous Australia Zoo) throughout the country. A drive in the outback or national parks will yield the best wildlife if you camp and let the wombats, wallaroos and other creatures come to you. This page highlights some of the unique insects, snakes and lizards of Australia. For mammals (like kangaroos!) see the Australia Mammals page. Interested in avi-fauna? See our Australia Birds 1 and Australia Birds 2 pages. 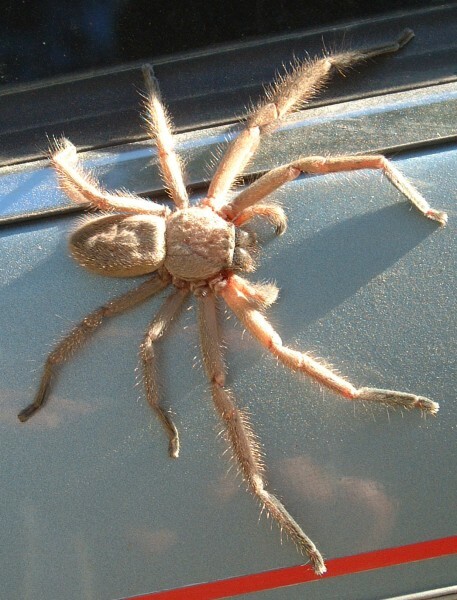 In Australian, the native wildlife hops, crawls, lurks and flies around you daily. 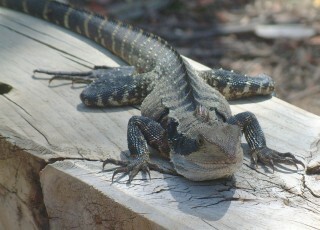 You needn't go to parks to see kangaroos, emus, possums, parrots, spiders or lizards. Some animals are harder to locate than others: koalas live in the wild throughout the eastern coastal forests but are difficult to see high in their gum (eucalyptus) trees. 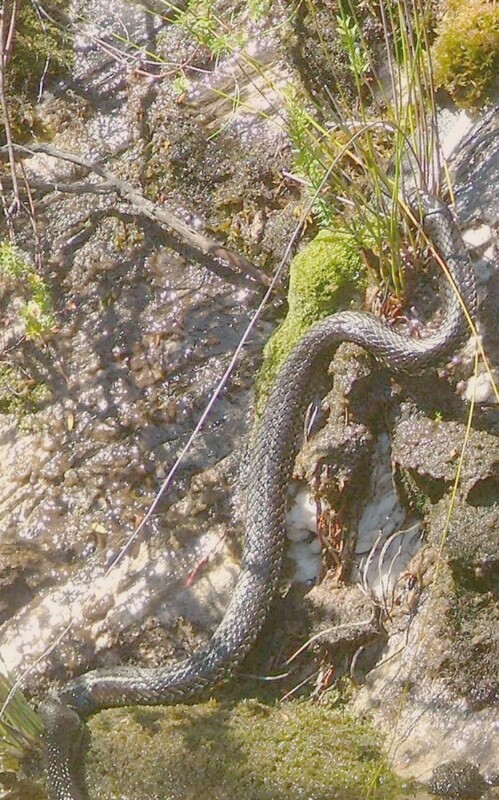 Snakes are everywhere, but are afraid of humans (for the most part) and are elusive. The lovely energetic foraging platypus is found in many streams but prefers to hide in its burrow by day. Insects abound. Australia is a naturalist's dream. That being said, campgrounds in national and regional parks are great places to see wildlife. There are many wildlife parks (a step up from zoos) where you can see some of the more elusive animals. All of the photos on these pages were taken in the wild unless otherwise noted. Go to our Australian Mammals page to learn more about the kangaroos, wombats, wallabies, koalas, dingos, possums and more. We photographed too many birds to limit them to just one page, so we've split them into two pages: Australian Birds 1 and Australian Birds 2. REPTILES: Australia has over 700 species of reptiles, more in the warm north than the cooler south, and is famous, or infamous, for being home to more than 3/4(!) of the world's poisonous snakes. Luckily, most of these are shy creatures and avoid contact with humans. 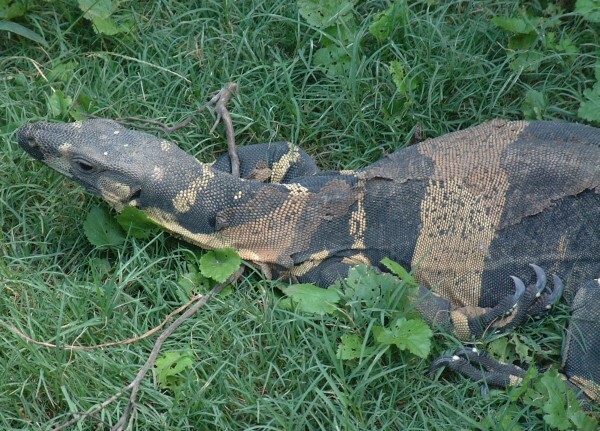 In addition to snakes, there are many species of skinks, geckos, turtles, the salt and freshwater crocodiles, and lizards. Friends on the yacht Zen got shots of this Tiger Snake in Tasmania. About 2 meters (6.5 feet) long, the tiger snakes of Australia prefer cool swamps and woodlands. They feed on birds, fish, frogs and small reptiles. Male tiger snakes engage in a ritual wrestling match. The tiger snakes are born live, each female producing from 15 to 80 young! On the right the snake is hunting over rocks and through bushes. The other shot of the same animal shows it in a cool lake where it hunts for fish. Tiger snakes are active in day, and when they're threatened they hiss loudly, and raise their head and fore body off the ground, flattening it. They're saying "Keep away!" Good idea. The venom of the tiger snake is potentially fatal to humans. On the right is a Carpet Python. These beautiful, non-venomous snakes, like all pythons, kill their prey by squeezing and are harmless to humans. 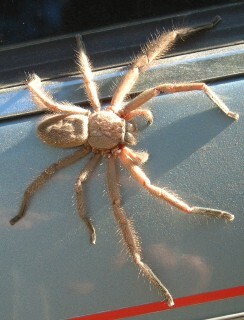 This one was killed by a vehicle in the east coastal forest of Fraser Island, Queensland. 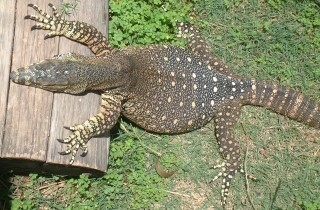 Lace Monitors (Varanus varius, meaning many-colored monitor) are large lizards found all along the eastern side of Australia. They come in two forms: either spotted (left) or barred (right). They spend a lot of time in trees, but also forage for frogs, small birds, carrion and food scraps in campgrounds. 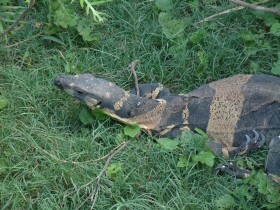 Lace Monitors can reach up to 2 meters (6.5') long from head to tail and will not harm humans. 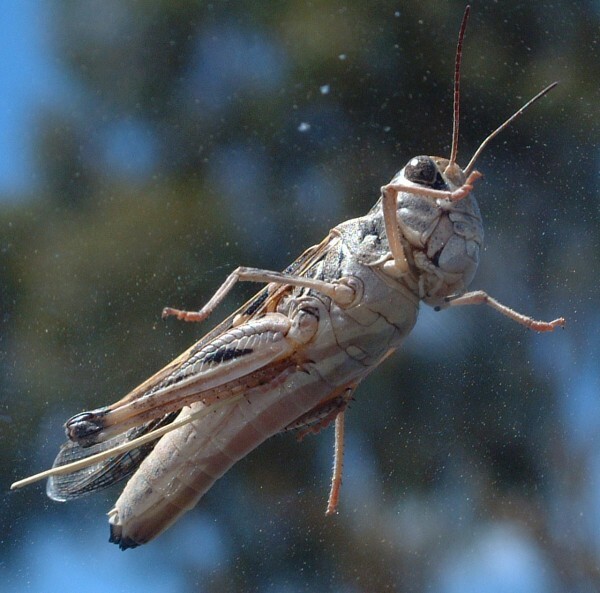 They usually lay up to 12 eggs in termite mounds, allowing the termites to close the hole they have dug, thus protecting the eggs until they hatch. Photos taken at the Woolshed Park, Brisbane. Left and right are 2 views of the Eastern Water Dragon, a common lizard in E. Australia. 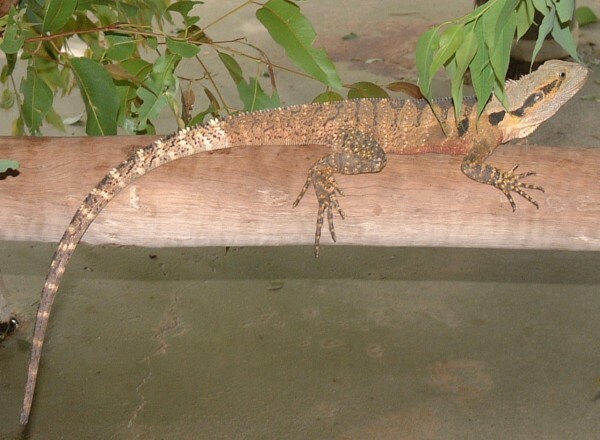 There are over 60 species of dragon in Australia. All are rough-skinned and are day active. They cannot shed their tails. their tails. There are over 300 species in Australia. 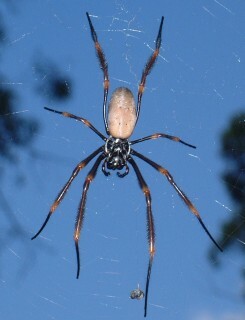 SPIDERS: Australia has 69 of the 116 Families of spiders in the world, or 60%. 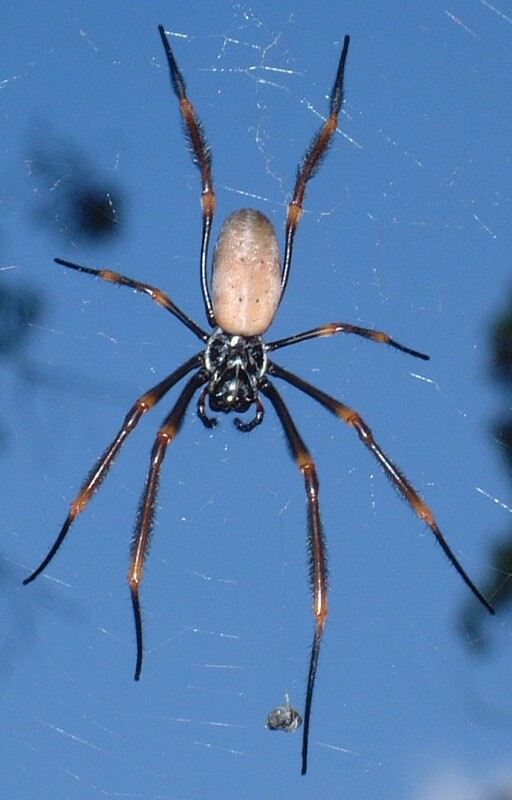 Most are considered "modern" spiders with fangs that move from side to side, have a spinning plate and 3 pairs of spinnerets, and use silk for egg sacks, shelters, and to weave catching webs. The "primitive" spiders have fangs that move up and down, do not usually have a spinning plate, have only 2 pairs of spinnerets, and do not usually make catching webs. We don't have positive ID on these two but we've put our best guesses below. Freshwater Crayfish and land crabs have 2 pairs of antennae, a body divided into head, thorax and abdomen, and have part of the body covered by a carapace which acts as a shield. 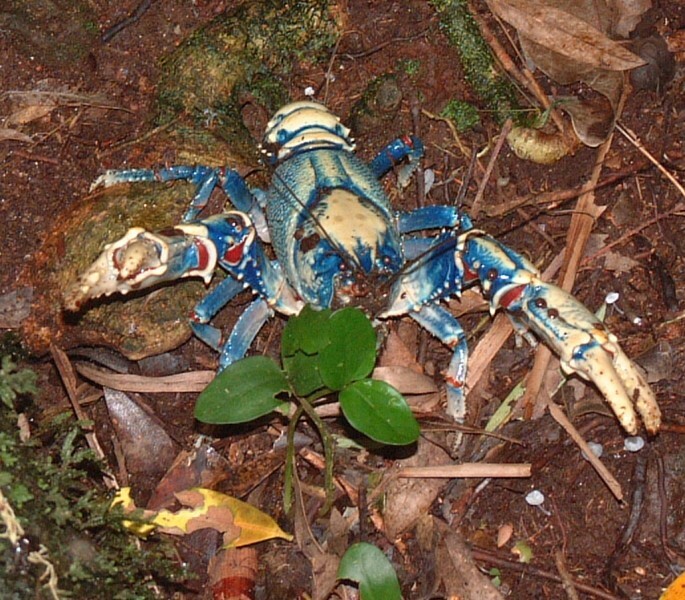 What a surprise to be hiking in a rainforest (Lamington National Park, southeastern Queensland) and come upon this wild blue crayfish that was traveling from one pond to another along our trail! The cray's first pair of 5 legs form powerful pincers which definitely kept us at bay! These animals live in areas with unreliable rainfall and can bury themselves in burrows during drought. They can grow to over 15" or 40 cm. 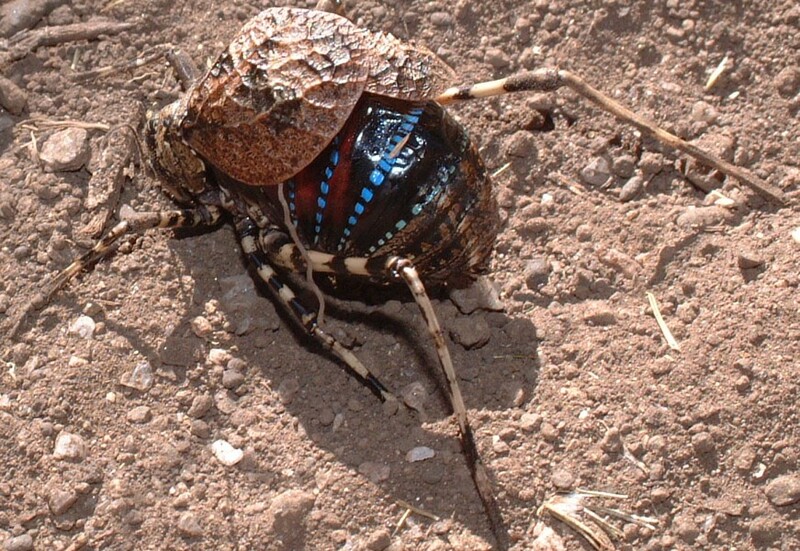 The body on this fat, colorful bug was over 1"
armor. We found it in the Snowy Mountains. INSECTS: We're not able to identify this interesting creature on the left, or the large grasshopper to the right, but they were fun to find and photograph.